Oh my word, Sylvie, this card is absolutely gorgeous! So elegant, a beautiful colour combo and lots of yummy little details - fabulous! WOW!! this is stunning. The colours are gorgeous and I love the pleated trim at the bottom.So effective,the whole card is gorgeous. Wow this is a fabulous layout. Gorgeous colours and papers and beautiful embellishments. I love this stunning card. What a stunning card I love it! Those colours go so well together and the twisted easel looks fab. Wow this is fabulous, the colours are gorgeous, I like the trim at the bottom and the butterflies. Simply delicious card Sylvie. It is so gorgeous. 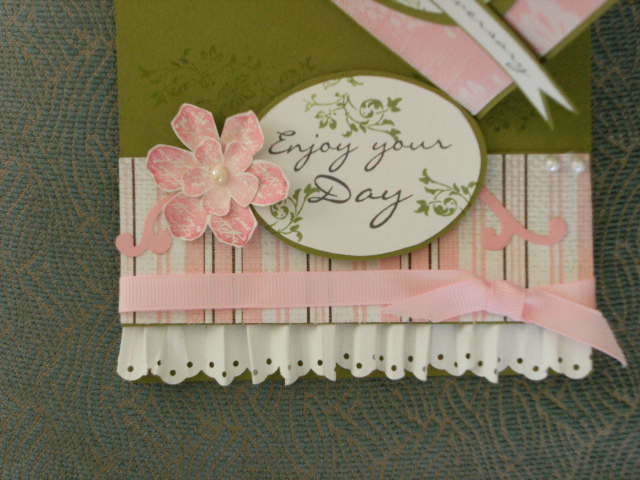 This is such a pretty card and I love the paper frill. 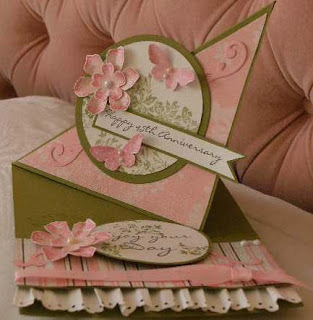 Hi sweetie this is gorgeous I am loving these twisted easel cards I will hopefully get to try make one over the weekend. Love the colour of this. Congrats about your cards selling altho I'm not surprised cus your cards really are so beautiful hun. Hope you have a fab weekend. Ooh this is so beautiful! Gorgeous colour and papers too and the card style is great!